Luxury mobile phone maker Vertu today opened its first boutique store in India, here, with plans to expand to other cities like Mumbai, Hyderabad and Bangalore. "There is a huge growth opportunity here. People in India today are well travelled, they appreciate luxury products ...We want to tap that potential," Vertu President Perry Oosting told PTI. Though he did not comment on the investments made, Oosting said the company would expand to other major cities in the country through a partner-based model. British firm Vertu's handsets are available exclusively in over 500 stores globally, including over 100 dedicated Vertu boutiques in 66 countries. Earlier this year, Finnish handset maker Nokia had sold majority stake in the company to private equity group EQT VI but retained 10 per cent minority share. "India's contribution to our revenues is currently in the single digit. We believe there is potential to grow this to double digits," Oosting said. The company has plans to expand to other cities like Mumbai, Hyderabad and Bangalore. 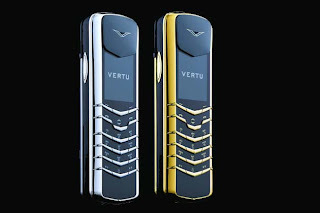 Previously, Vertu phones were available in the country across 20 points of sales through luxury products distributors. With the first flagship store in New Delhi, Vertu hopes to deliver the very best to its customers, Oosting said. Talking about the luxury mobile phone market, Oosting said it is similar to the luxury car market. "When we started out, our model was similar to that of luxury watches. But with changing technology and phones becoming a productivity tool, it is now more on the lines of luxury cars. While there is a design element, one also has to keep in mind what goes into the phone and the performance in terms of battery backup, security," he said. The company has also launched Vertu Constellation Smile, a variant of Vertu's Constellation Touch priced at Rs 2.96 lakh. The handset has been designed to celebrate a partnership between Vertu and Smile Train, a global organisation based in New York City providing free corrective surgery for children with unrepaired cleft lips and palates.